Nepenthes truncata X N. veitchii is hybrid between a lowlander and a highlander. 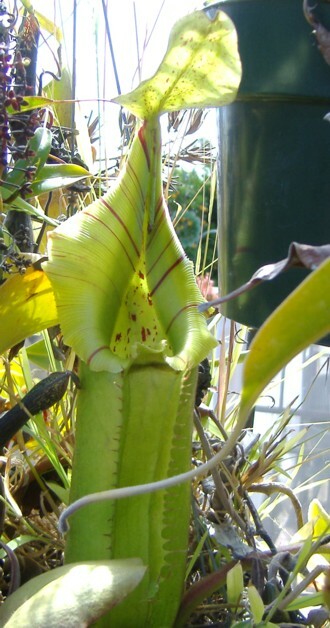 Even though N. veitchii was a highland parent, that doesn't mean it prefers highland conditions. Generally speaking, the highland N. veitchiis that are currently available tend to like slightly warmer conditions than typical highlanders. I've been growing this hybrid as a highlander and it has taken a while to acclimate. It really would do better in intermediate temperatures but it does tolerate my winters. This particular hybrid was a remake. I've seen cuttings on Ebay from Tristan's that use the striped N. veitchii form at various times and is quite showy. I can't recall if that hybrid is the reverse cross N. veitchii X truncata. Regardless, both hybrids are very attractive. It became available in 2008 from seed and plants seemed to be snapped up very quickly and then disappeared indicated a strong demand for this hybrid. The appearance is similar to N. truncata and doesn't vine. It's somewhat of a slow grower so cuttings in the future may not be available for a while.